Perouges is a medieval walled town perched on a small hill overlooking the Ain River in the eastern part of France, about 38 kms. northeast of Lyon. 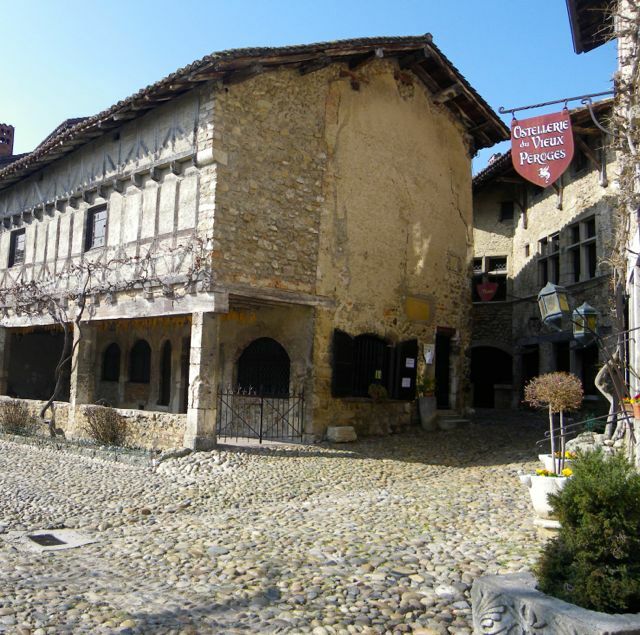 It is usually referred to as the prettiest medieval town of France. Even fifteen hundred years ago, people immigrated and brought their culture with them in the backs of donkeys and leather shoulder bags. 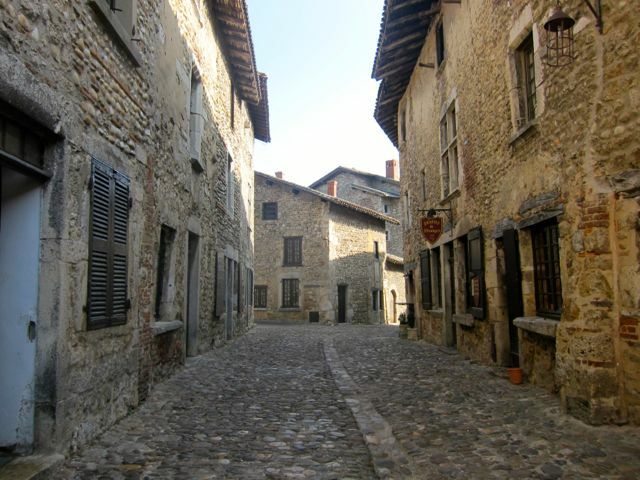 Perouges is named after the Gallic wanderers that founded it from Perugia in Italy and with its low stone buildings and flagstone walkways, it has managed to escape many of the changes since that time. Driving in is entering another world and you peek around corners looking for gnarled peasants and flying slop jars. Yes, it’s a little off the beaten path safely up the hillside, about 30 minutes from Lyon, but it’s definitely worth a morning’s visit as the wonderful smells of baking seem to escape from almost every shop front. 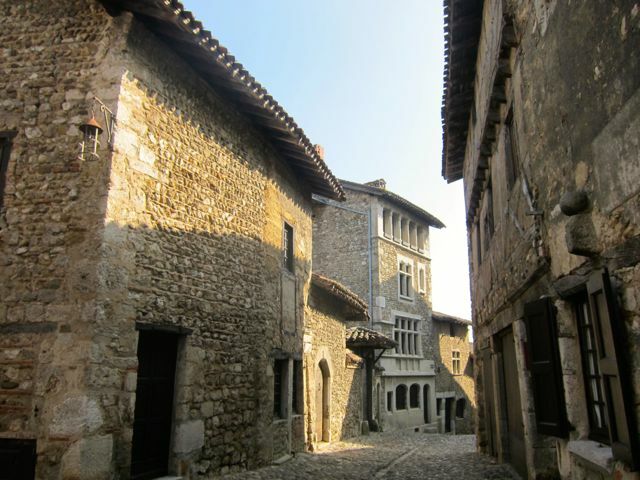 Start your tour of the village from the Upper Gate. 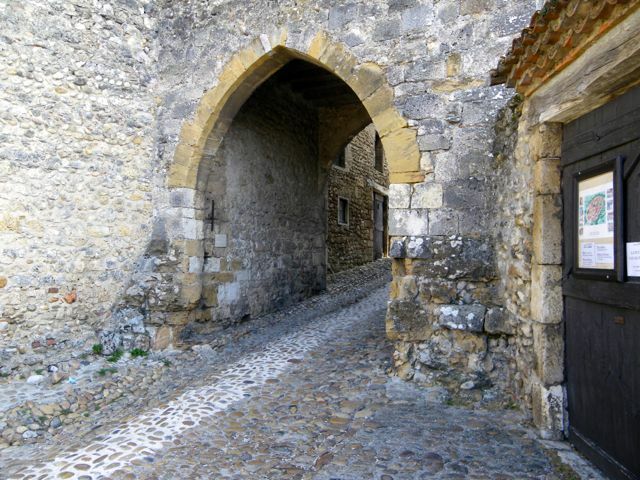 As a walled city, it had escaped some of the incursions of armies. In 1601, it became French and by the 18th century, it had a booming textile industry attracting many weavers and craftsmen. Sadly, in the 19th century, with the rerouting of roads and railroads, its population dropped from 1500 to 90. 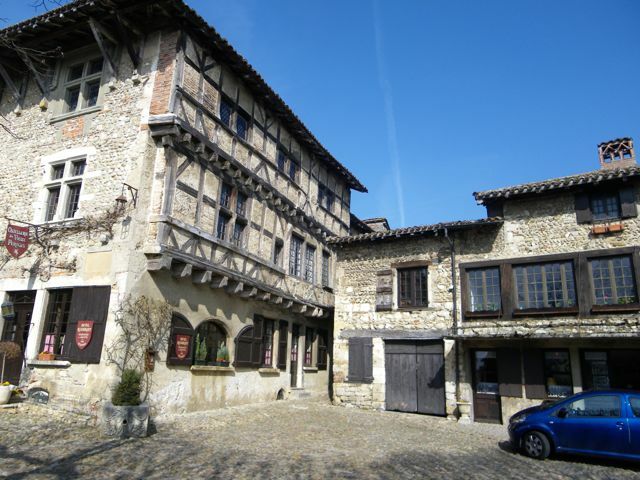 There is a small museum to mark the village's weaving industry. 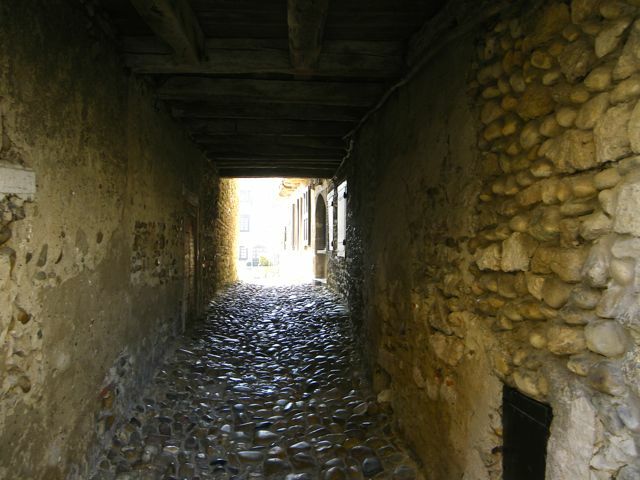 Starting as early as 1910, many of the houses had been restored and today, it attracts many visitors who enjoy meandering around Perouge's cobbled streets looking at these old houses. 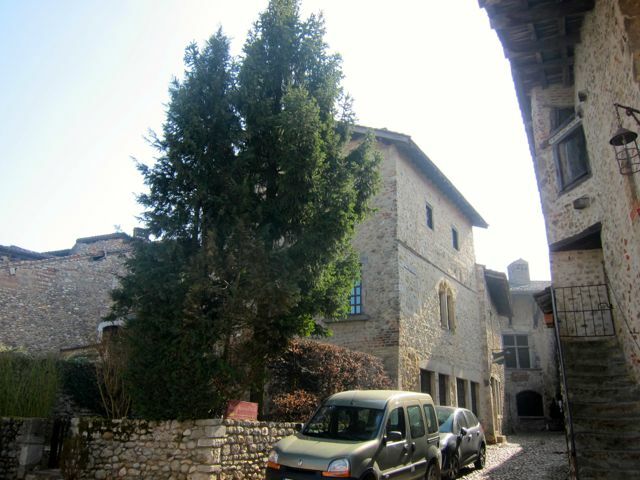 You can explore the Church and the house of the Princes of Savoy with its beautiful garden. The Church has quite an interesting history. 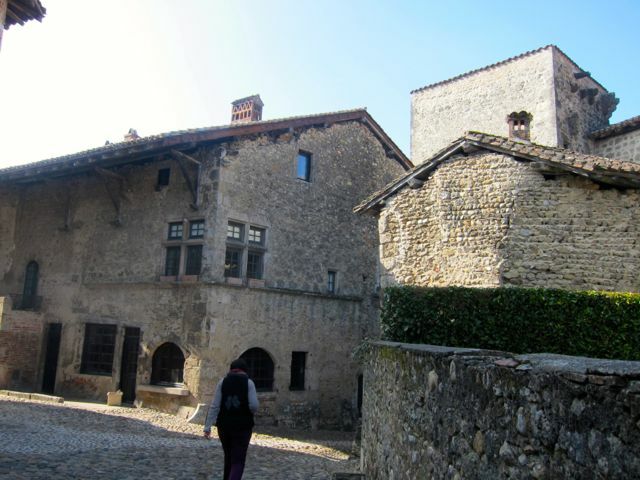 It was destroyed by the villagers themselves when the village was sieged in 1468. they needed everything they could lay their hands on to strengthen their fortification so the Church was not spared but the village was. so, a year after this attack, the villagers restored their Church. At the centre of Perouges is ​the Place du Tilleuls where the inhabitants planted the Tree of Liberty just after the French Revolution. Around this square are some of the most beautiful houses. Leading to this square is the merchant street called Rue des Princes, the merchant street so the houses have wide bay windows for the display of goods. 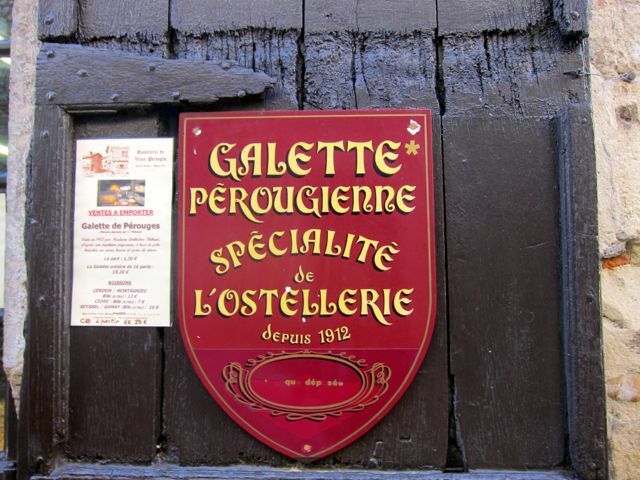 There are several quaint restaurants to try out in Perouges but don't forget to try the Galette, their long-time specialty since 1912. Here's a link to a recipe of Galette which you can try in your own kitchen.